Commonly referred to as purveyors of the "Boutique de Junque"--a small collection of letterpress items that has become a hobbyist's dream gone wild in Indianapolis, IN--we are earnest supporters of the letterpress trade for both beginners and professionals. If you are looking for any letterpress related item, we likely have it, including: tabletop printing presses: Chandler and Price, Sigwalt, Kelsey, Daughaday, Victors, Craftsmen, Baltimorean, Golding, and others. Proof presses & sign presses: Line-O-Scribe, Showcard, Nolan, Chandler & Price, Vandercooks and others. Miscellaneous equipment including composing sticks, quoins, keys, wood/metal furniture and cabinets, wood and metal type of all sizes, chases, rollers/cores/trucks---etc., if it exists, we likely have it. Too many items to list--if you don't see it on this list, please contact Andrew. A voracious reader and an impassioned collector, trader, (humble) aficionado, published author, dealer, dabbler, impresario - Dave had many and vast interests and pursued those with focused, bohemian glee in his post-business years. 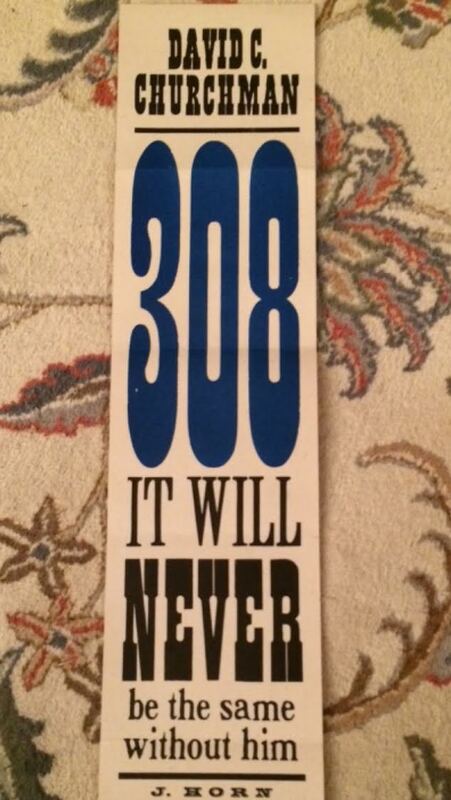 These interests ran far afield - cigar bands, fountain pen tips, drawer pulls, antique letter openers, philately, etc. Yet his one lifelong passion was letterpress printing. It grabbed him as an Indianapolis Northside boy and after college, he fell hard. Letterpress printing was his joy and obsession for the past sixty years. 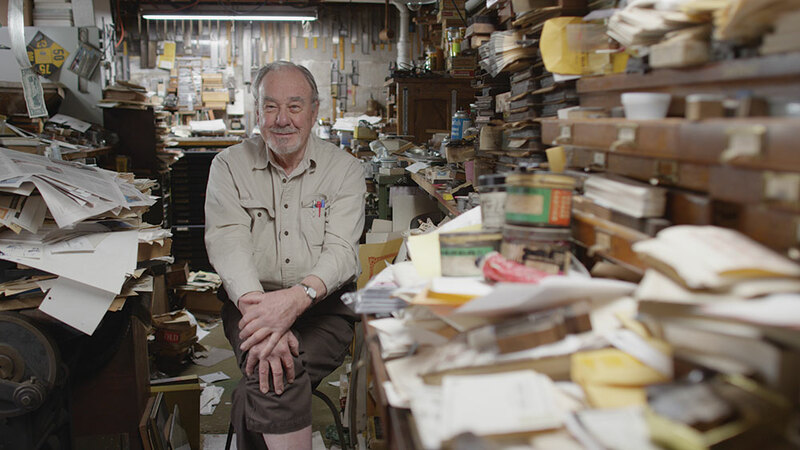 Throughout his adult life he bought, sold, acquired and accumulated an ever-increasing collection and inventory of letterpress equipment and ephemera. Dave was known throughout the nation and internationally as an authoritative expert and trusted dealer of all things letterpress. He will be featured in an independent documentary film, Pressing On, which chronicles the current mini-renaissance in letterpress printing. His printing press once shared the marquee in the 1992 Smithsonian Institution exhibit The Boy and His Press. Dave passed away unexpectedly on December 28th, 2015. 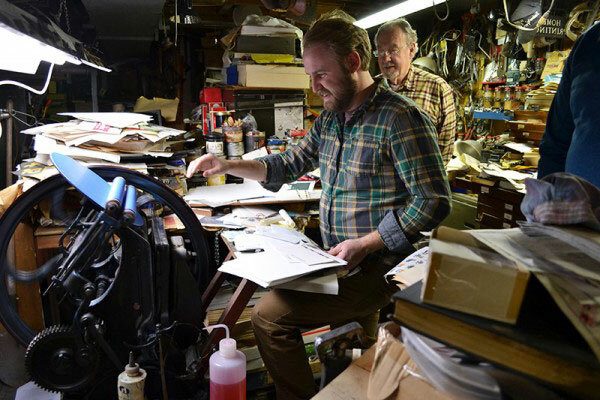 The letterpress community--especially his family--misses him dearly. 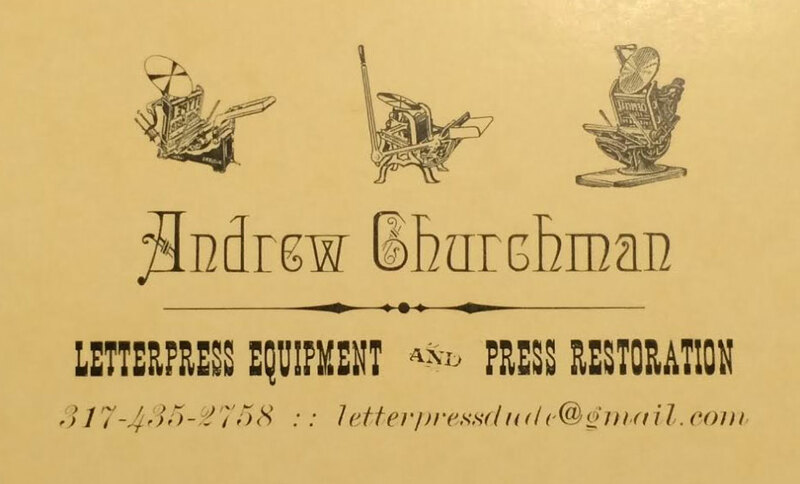 While looking for some extra cash to help make ends meet during a professional transition, Andrew's father and letterpress guru, Dave Churchman suggested the letterpress equipment business as an option. After regaining consciousness, Andrew looked into it and saw some potential. With his father's guidance and mentor-ship, Andrew has developed an excellent working knowledge of letterpress equipment, specializing in tabletop self-inking platen presses and proof / sign presses. Andrew also focuses on delivering new, efficient product solutions--especially complete packages--to the amateur and experienced letterpress user. Contact Andrew about any of your letterpress needs.